An elegant dress shoe for those special occasions. 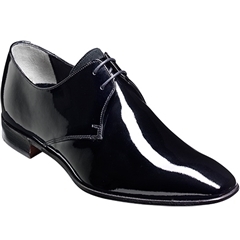 In the Derby style, with an open lacing section, this eye-catching black patent shoe has contrasting black suede on the tongue. If you're looking for a statement pair of patent's for a big event, the Goldington is ideal!